​BethRock Limo can assist your business or company in several ways. We can collect your clients, your staff or partners and suppliers from the airport. We can arrange all your logistical needs when it comes to arranging transportation for your staff to attend conventions, meetings, social and corporate events. 1. Stand out from the rest. To succeed in business it is necessary to stand out from your competitors. Our fleet of vehicles stands out from those of our competitors in the area. Let us achieve our goal and allow us to help you make your company stand out too. 2. We can meet all your requests. Whatever the time and schedule, or the number of people involved we can handle it. Whether it is dropping off an important client at the airport or transportation for a multifaceted corporate event, we can meet all your requests. 3. Our chauffeurs are excellent. All our highly trained drivers are professionally attired, polite and on hand to help out as and when they can. Punctuality and delivering our clients to their destination in comfort is our business. 4. Our fleet is varied to meet all your requests. 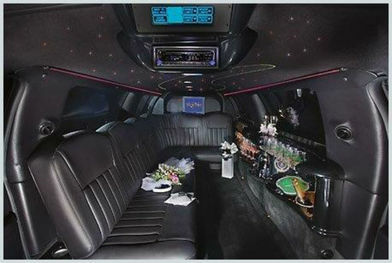 Our fleet of vehicles is extensive and includes town cars, stretch limos and party buses. Each of the vehicles is valeted and carefully prepared prior to each booking. 5. Our limos are well appointed. Each of our luxurious limousines has sumptuous leather seating, a flat screen television, CD/DVDs and high quality lighting. Additionally they are fitted with a bar area with stem glassware, bottled water and ice. Ideal for work on the way to a meeting or to the airport, or for a great time when on a corporate outing such as a golfing event.